Does this volume carry enough story to really sink your teeth into? Read on to find out. As Helsing gets closer to finding out the truth about her father’s death, she and Harker are joined in their quest by a schoolteacher named Mina. With the help of these two, Helsing travels to England, unaware of the horrific surprise waiting for her in the shadows of her hometown. I want to start this off by saying that this mini-series has been a welcome addition to the wide birth of content that populates this shared space. That said the narrative spun by this creative team can be interesting and exciting but it’s also very predictable. Which works for and against the finished product and its ultimate outcome. Pat Shand deserves a lot of credit for tackling a comic franchise that’s seeking to re-interpret an old odyssey born from, perhaps, the most iconic monster of all time. Since the events of Grimm Fairy Tales Unleashed, especially the Vampires: The Eternal tie-in, I’ve had nothing but positive thoughts for a side that’s overflowing with supernatural horrors. And as this specific journey unfolds it follows a simple path which highlights the needs of our huntress. Liesel Van Helsing is a woman out of time that desires the truth about her father and so literary elements assuredly collide. The visuals done by Tony Brescini click together with the text in a splendid way. The comic is chock-full of steady renditions as it emboldens a display that highlights and expands the plot while asserting additional sensory details to sell this vampire yarn. The assist by Andres Esparza near the end helps to inform the audience as the talents leads up to a cliffhanger. But when you add in the colors done by Fran Gamoba and J.C. Ruiz the finished product simply sparkles and shines. 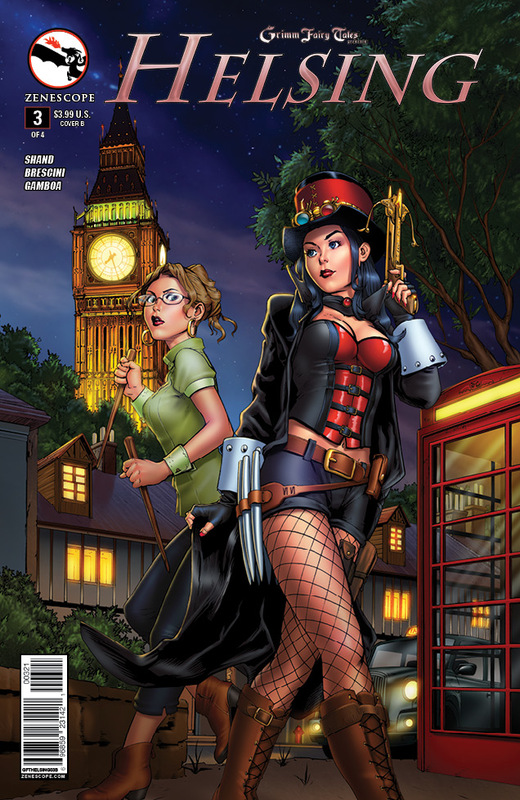 Grimm Fairy Tales presents Helsing #3 is a continuation that builds up its importance in the right way. As this yarn gives plenty of space for the saga to crescendo, so in short: it earns a recommendation from me. 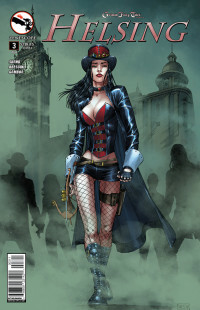 + Liesel Van Helsing vs monsters... 'nuff said! + Pat Shand delivers a rather solid script. + Sturdy artwork by Tony Brescini.